One of the first reactions people have when investigating Golden Dawn-style ceremonial magick is one of frustration due to how many ritual objects and tools must be obtained or constructed. In their book, Self-Initiation into the Golden Dawn Tradition of Magick, Chic and Sandra Cicero recommend that if the Aspirant is not able to obtain all of the implements and furnishings required for a complete Golden Dawn Hall, creating a “cardboard temple” can be an acceptable substitute when getting started. The Paper Temple Series is planned to be five separate decks of cards which will be a complete set of symbols needed to get started with working magick in the Golden Dawn tradition. The first of these decks – available now – is the “Officers of the Hall.” This deck contains 43 cards representing the officer lamens, weapons and implements of all of the officers of a Golden Dawn Ritual Hall for all grade rituals from 0=0 Neophyte through 5=6 Adeptus Minor. Cards can be used to plan the stage directions for your own rituals or as energetic placeholders within your rituals if you do not have enough people present to fill all of the officer roles. Another possible use would be to construct actual officer lamens by cutting the lamen cards and gluing them to wooden disks, then painting over them with a clear coat. Although we at WOGD have constructed or obtained many of the required ritual implements, we have used the officer lamen cards from our prototype deck in ritual to good effect. 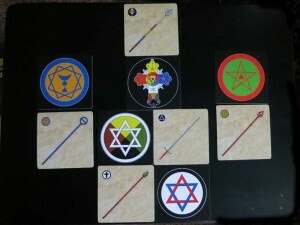 We also have plans to use the eventual complete set of Paper Temple cards as an oracle deck. Indeed, we have had some good results using some of the prototype decks for this purpose. 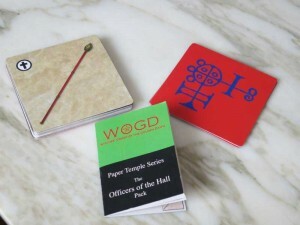 The Paper Temple series is designed to be compatible with the Flashing Flashcards deck for this reason. Furnishings and Decor – This includes various altars, the pillars, the complete interior of the Vault of the Adepti (walls, floor and ceiling), several banners, path markers and more. Aspirant – The Aspirant pack will include the admission badges needed for all of the Grade Rituals, some ritual items which are traditionally worn by the Aspirant, plus all of the Temple diagrams encountered in those rituals. Portal Plus – Much the same as the Aspirant pack, but geared toward the rituals of the Portal and of the Adeptus Minor. Ritual – This pack will contain various items used in one or more rituals which do not fit into any of the previous packs, plus maps of the Temple layouts for all of the rituals.